In what our country considers to be an overt act of war, the government of Irata has illegally seized control of the Uhtarie River. This river has long been recognized as the natural border between Irata and Cigami, a protectorate of our nation since the signing of the Edacra Treaty of 1985. Failure to respond to this aggressive act would only encourage additional acts of violence. To protect American business interests and restore peace to this turbulent area, we formally declare war against the Republic of Irata. What you are about to read has been classified top secret. Nothing contained herein is to be divulged to anyone with a security clearance lower than your own. The following information pertains to a secret mission that has been given the code name River Raid. You are to infiltrate enemy territory, locate the Uhtarie River, and destroy all enemy units stationed in said river. This is a mission of total destruction. Everything in your path is to be obliterated. The success of this mission will be measured in the amount of property to which you lay waste. Enclosed please find a pilot's manual and information on the enemy gathered by overseas intelligence operations. The 73 is the country's most advanced aircraft, and as such, final testing has not been completed. All existing models at this point are lab prototypes. Early unconfirmed reports indicate that the CPU-73 is capable of feats for which it was not designed. Should you encounter any such unusual capabilities, notify your commanding officer immediately. Discuss no such information with subordinates. Rather than using a contemporary windshield, the pilot flies blind and watches his actions on a video monitor that displays an aerial view of the CPU-73 via a support satellite. In addition to the river itself, a fuel gauge and score are displayed at the bottom of the screen. See attached photos taken by U2 surveillance planes for sample displays. Using futuristic ez-band radar coupled with a proven auto-pilot, the altitude of the 73 is controlled by an onboard computer. This frees the operator to man the more intricate controls. Warning: to defeat enemy radar, the CPU-73 flys at such a low altitude that flying over anything except water will most likely result in a lethal collision. One of the remarkable features of the CPU-73 is that the steering controls have been simplified to the point where a cadet fresh out of flight school can easily deal with them. Moving your stick to the right or left causes the craft to follow in the same direction. Warning: the 73 picks up momentum when it is engaged in a turn. If you are not careful, you may misjudge your speed and crash into the river bank. Destruction of your jet is strongly discouraged. The jet engines of the CPU-73 are of such special nature that at this time no information concerning them can be disclosed to anyone outside of the Technical Development Command. It is sufficient to state that the engines are powerful enough to keep the craft airborne at a very slow speed. To fly at minimum velocity, pull the control stick all of the way back toward your body. For maximum velocity, push the stick as far forward as it will go. The most primitive feature of the 73 is its missile launcher. Due to cost overruns, contractors had to scrap the planned futuristic firing system and unfortunately, the 73 is equipped with an antiquated missile guidance system that can handle no more than one missile in the air at a time. As long as the red firing button is depressed, missiles will be launched as rapidly as possible. Note: with Congressional approval in the coming fiscal year, we hope to upgrade to a more effective missile system, but until such time, all CPU-73s will have the old style firing mechanism. Located at the bottom of your monitor is a gauge that displays the amount of fuel remaining in your aircraft. When the yellow line reaches a quarter tank, a warning buzzer sounds. If you exhaust your fuel supply, the CPU-73 will self-destruct. It has been ascertained that the entire Irata fleet and airforce is concentrated in and above the Uhtarie River, preparing for a full-scale attack on Cigami. Intelligence feels that swift completion of Operation River Raid has the potential to cripple the Irata forces in one fell swoop. A breakdown and analysis of enemy units follows. These rather large seagoing vessels can be identified by their distinguishing colors: red, black, and blue. They can move only in the direction that they are pointed, and they turn around whenever they reach a river bank. Due to their size, destroyers make easy targets and are worth only 30 points when sunk. Although it is embarrassing to note, the Air Force of Irata relies heavily on helicopters purchased from our country's military surplus stockpile. The chopper pilots have strict orders to protect the destroyers--they are not permitted to leave the river. These blue copters fly in the direction that they are facing, and like destroyers, they reverse direction when they reach the edge of the water. Two factors in favor of the helicopters are that they are small and fast, which makes them worth 60 points each. Irata has only a limited number of modern jets, which means that encounters with such aircraft should be minimal. You will penetrate a substantial amount of territory prior to your initial jet sighting. Jets always attack from the sides of the river, hoping to run into your plane. Their diagonal passes make them difficult to shoot, and therefore bounty for each downed jet runs at 100 points. The one thing that helps the enemy immeasurably is the availability of fuel right in the river itself. The rectangular red and white tanks can be destroyed for 80 points. They may also be used to refuel your own fighter. The river is divided into sections by large bridges that span the width of the waterway. Blowing up these wooden bridges will cut Irata's land forces off from Cigami; 500 points are awarded for each bridge destroyed. Several mock raids were recently staged along a desolate river in the Midwest to determine the battle effectiveness of the CPU-73. Below are first-hand observations printed in the words of the few pilots who survived these trial runs. While it must be kept in mind that said tests were not conducted under actual field conditions, the findings are of considerable value. Fire your missiles conservatively. Since you may have only one missile in the air at a time, it is important that you fire only when necessary. When you do launch a shot, aim accurately because waiting for a stray missile to disappear costs precious time. Simply firing up the river when there is no enemy present is foolhardy--this may result in shooting a tank that you need for fuel. Another thing to remember is that if your finger is on the trigger when a missile either goes off the monitor or hits a target, another missile is fired immediately. Many situations call for a single shot--when you want to destroy a helicopter, but not the fuel tank directly behind it, for example. In these cases, you can squeeze off one shot by quickly tapping the fire button when your target is in sight. If you spot a stationary enemy craft upstream waiting in a cove off to the side, extra precaution should be taken. I have seen many an inexperienced fighter slow his jet down as he waits for the enemy to move into firing range. Most of these fighters are no longer with us. What you should do under similar conditions is speed up the moment you spot the enemy. As you near his position, slow down by pulling straight back on the control stick. This trick can be used quite effectively to coax the enemy out of hiding and into your sights. Remember, your mission is to destroy as much as possible. 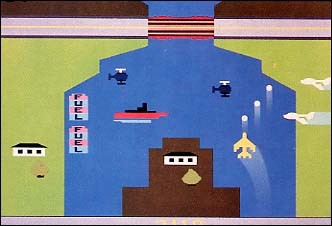 If you set a slow pace as you fly up the river, you have plenty of time to shoot at most every enemy unit in the water. Don't be afraid to go slowly--it reduces the chances of accidents and increases the number of shots that you can fire at the enemy. At times, the river is split by large central islands. Judging from the elements that can be spotted to both sides of the land mass, you must quickly decide whether to go to the right or left of the island. If you are low on fuel, choose the path that looks as if it offers little resistance and a possibility of a fuel tank. If you have plenty of fuel, go for the route that appears to have the most enemy units for you to destroy. I have noticed that more fuel is transferred to your jet if you pass slowly over the fuel tanks in the river. The slower that you go, the more fuel you receive. If you pass over an entire tank at minimum velocity, you pick up half a tank of fuel. When you have completely filled up your tank by flying over a fuel tank, a soft bell will ring. When you hear this reminder, quickly fire a missile. If you are on top of a tank and you launch a missile, the fuel tank blows up and you are awarded points. See, you can have your cake and eat it too. Once you establish visual contact with a bridge, move to the center of the river. Regardless of the situation around you, fire upon the bridge as soon as possible. Bridges carry the highest point value, and destroying them should be your first concern. When the buzzer sounds, warning you that your fuel is running low, ignore the enemy and make a dash up the river in an attempt to find the nearest fuel tank. The rate of fuel consumption is not proportional to velocity, so don't worry about depleting your supply. When you spot a tank, slow down to receive the maximum amount of fuel. These mad sprints up the river can be avoided if you take advantage of every opportunity to top off your tank. Jet fighters are the most evasive of all the enemy forces. Their quick diagonal passes make them difficult targets to hit. The best method of shooting a jet is to reduce the amount of distance between the two of you. When the jet is in range, fire away. If you miss, speed up so that after it wraps around the screen, the jet flys harmlessly below you, instead of into your blindside. Be on the lookout after each jet encounter since the enemy usually sends them in pairs. Operation River Raid depends solely upon your skill and how well you apply the information you have just absorbed. Due to the secrecy of this mission, you are now to take these papers and personally see to it that they are either placed in the incinerator or put through the paper shredder. May your aim be true and your trigger finger quick. Good luck.